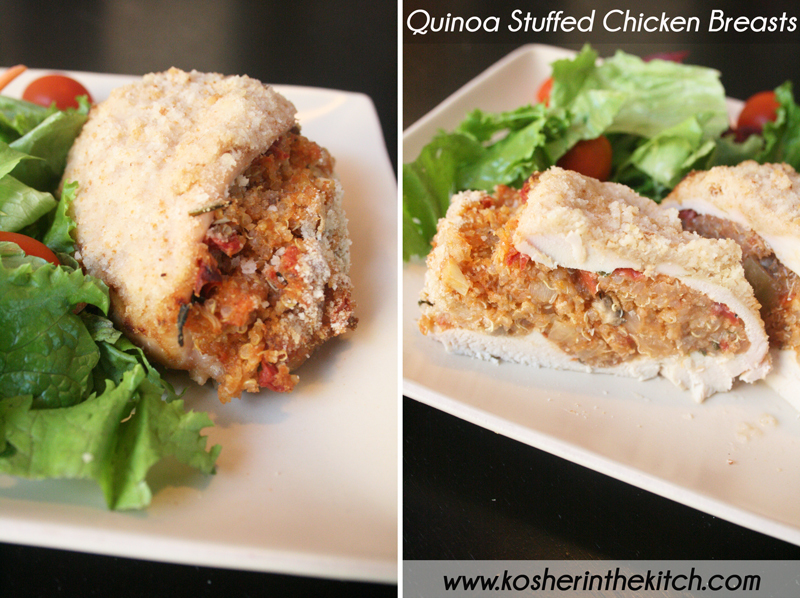 Quinoa Stuffed Chicken Breasts - Kosher In The Kitch! Quinoa Stuffed Chicken Breasts - Kosher In The Kitch! 1. Place quinoa and broth in a pot, bring to a boil then lower flame and simmer until liquid is absorbed. Fluff with fork, then set aside. 5. In a large frying pan, saute the diced onion and 4 garlic cloves until tender. Add the can of diced tomatoes, chopped mushrooms, chopped parsley and salt and pepper. Cook for 5 minutes. 6. Remove from pan and put tomato mixture in a bowl. Add 1/2 cup of breadcrumbs, mix well. Add 1 cup of cooked quinoa. Mix well. 8. Place in a greased baking dish, and fill the center of each chicken cutlet with the quinoa mixture, then fold over in half so the quinoa mixture is covered. 9. Drizzle tomato sauce on top of stuffed chicken, or spread honey mustard on top of chicken, then sprinkle bread crumbs on top. 10. Bake, covered with foil in oven on 400′ for 30-45 minutes until cooked through. Im looking for a stuffed chicken recipe and we love quinwa and mushrooms and parsley. My husband hates onions tomatoes. Is there another version of quinwa stuffing that u could recommend? I made the roasted butternut squash/quinoa salad last weekend. 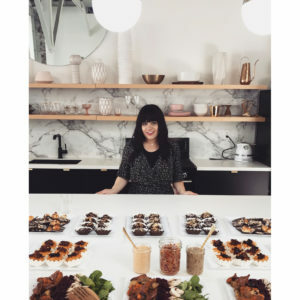 Delish….. Can’t wait to try this one. Looks like it can be made ahead, and cooked just before serving, or cooked and reheated slightly. First, you add 1 can of diced tomatoes to the onion and garlic mixture. Once the chicken breast is stuffed with the quinoa mixture, you have the option of pouring tomato sauce on top then adding breadcrumbs, or you can use honey mustard or even mayo if you would like instead.